research/polls | Stop Dog Whistle Racism! 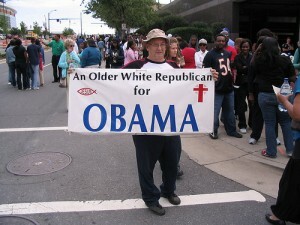 A recent story onP olitico.com finds that Barack Obama is “poised to win the largest share of white voters of any Democrat in more than three decades.”The article reports that 44% of whites are supporting Obama. This means that Obama is poised to get more white voters than Bill Clinton, Al Gore, John Kerry—every white Democratic candidate except for Jimmy Carter, who had support from 47% of whites (image from Mr. Jincks). I am profoundly encouraged by the number of whites who have been able to move far enough past white racial framing that says that Blacks are lazy, inferior, unqualified, etc. to vote for a black candidate, and would be enormously pleased if these numbers reflect Politico’s expectations on Nov. 4. If we keep going and continue rejecting white racist framing and begin dismantling the institutionalized racism that perpetuates unequal opportunity, think of what kind of country we could have. Whether it will happen or not is still to be determined, and America has an unfortunate history of following progress with regression. But for the time being, I’m hopeful that broad white support for a black man might be the kind of change we can believe in. Nate Silver, the Michigan native who has effectively brought serious analysis of polling into the media in the current campaign, has an interesting article at Newsweek debunking the so-called Bradley effect. The Bradley effect has received much attention over the last few months. It’s named for Tom Bradley, the former mayor of Los Angeles who lost a bid to become the governor of California after the polls showed him with a substantial lead. This led political scientists to surmise that white voters who would not vote for a black man were unwilling to say that to a pollster, thus skewing the pre-election poll results. Many observers have wondered whether that pattern would repeat itself this year. Then there are this year’s primaries. Everyone remembers New Hampshire, when nearly all polls predicted a big win for Obama, but Hillary Clinton emerged victorious. That was a bad day for the pollsters–and for Obama, who underperformed the Pollster.com composite average by 9 points. (Still, it is not clear that there was evidence of the Bradley effect at work here. Contributing factors to Obama’s loss may have included his “nice enough” comment, Senator Clinton’s teary moment in the diner–and a simultaneous GOP primary, which allowed McCain to pick off some Obama voters who thought their guy was safely ahead.) What fewer remember is what happened two weeks later in South Carolina. In that case, the Pollster projection had Obama winning by 15 points–but he won by 29. That 14-point error was actually of greater magnitude than the mistake in New Hampshire, if less noticeable because the polls hadn’t picked the wrong horse. Democratic Strategist: Whither the Bradley Effect? Some nervous Democrats, watching as Barack Obama’s lead in the polls slowly grows, may be concerned that a lead of five points or so may not be enough, thanks to the notorious “Bradley Effect”–the phenomenon, named for Los Angeles Mayor Tom Bradley’s losing gubernatorial campaign in 1982, whereby white voters lie to pollsters about their willingness to vote for an African-American candidate. They should probably relax. FiveThirtyEight’s Nate Silver, who’s long argued that the Bradley Effect seems to have expired in recent years, offers a recapitulation of his arguments (nowreinforced by Bradley’s own pollster from 1982), along with speculation about why this has happened. All along, Silver’s argument has been very simply that during the primary season, Barack Obama generally outperformed his poll standings, which shouldn’t have happened if the Bradley Effect was operating. In retrospect, it’s clear that much of the talk about the Bradley Effect was spurred by the one primary state, New Hampshire, where Obama narrowly lost despite pollster predictions that he was ahead. Absent any fresh evidence–and the ability of pollsters to “push” respondents for honest answers should have produced some by now if it existed–it’s time for Democrats to stop worrying that racist voters will revert to type in the privacy of the voting booth. Racism, of course, still exists, and may be hurting Obama, but not in the sort of secretive, poll-refuting manner that is suggested by the Bradley Effect. As Silver points out, there are plenty of more socially acceptable reasons voters could offer for deciding to vote against Barack Obama, no matter what’s actually going on in their hearts and minds. Strikingly, the numbers are worse for McCain among independents: Only 29% say the Ayers association makes them less likely to vote for Obama, and more than twice as many — 64% — say it makes no difference. The data suggests that the vast majority of the respondents saying it makes them less likely to vote for Obama are Republicans, who probably wouldn’t have supported him anyway. There has been some discussion of Barack Obama’s relationship with the former radical activist William Ayers. Because Ayers is linked to plots to bomb the Pentagon and the U.S. Capitol in the 1970s, and because Ayres recently said he wished he had done more, some people say Obama’s association with Ayers calls into question his judgment. Does Obama’s connection with Ayers make you less likely to vote for him for president or does it not really make a difference to your vote? A quick additional point on this. Obviously this attack isn’t really about Ayers; it’s about sowing vague doubts about Obama’s patriotism and background. Whether that dimension of the attack is working is harder to measure, and may not be perfectly reflected in the answers to direct pollster questions about Ayers. Still, the above numbers are striking.